Phytic Acid - "Malabsorption Agent"
What is Phytic acid / Phytate? Phytic acid and its salt phytate (both generally referred to as phytate) is a plant seed's storage form for ~70% of its phosphorus (also the B-vitamin inositol) - most of the seed's phytate is broken down to release phosphorus and other nutrients, as a food source for the sprouting seed. Phytic acid is especially found in cotyledons and outer hulls of the seeds of oil-producing plants - particularly in grains (bran and germ), legumes, nuts, and other edible seeds. The cotyledon is inside the germ and provides food for the first leaves. Most phytic acid makes it through to the colon undigested and unabsorbed - phytic acid "laughs" at stomach acid and is not phased by our intestinal enzymes; in the colon; bacteria that produce phytase enzymes can begin to break it down, but most phytate leaves the body intact taking its phosphorus and any bound nutrients with it. Therefore, phytic acid only interferes with minerals in the GI tract, not in the bloodstream or in our cells. Phytic acid in food is only about 50% digestible by NON-ruminants - being able to chew the cud, ruminant animals can produce the phytase enzymes required to break down phytic acid. Humans cannot. Schlemmer, U., FrÃ¸lich, W., Prieto, R.F. and Grases, F. (2009) Phytate in foods and significance for humans: food sources, intake, processing, bioavailability, protective role and analysis. Mol Nutr Food Res 53, S330â€“S375. ✔ Before consumption using traditional food preparation methods that produce phytase enzymes - i.e. soaking, ideally, followed by fermenting or sprouting. E.g. properly soaking beans can break down 1/3 to 2/3 of their phytate content. Cooking / Roasting (E.g. common in manufacturing breakfast cereals) barely degades phytate, since the heat quickly destroys the phytase enzymes. "Mineral magnet" - the grasping "arms" of the phytic acid molecule tend to bind certain necessary mineral ions (multivalent cations, such as calcium (Ca++), magnesium (Mg++), zinc(Zn++), iron(Fe++) copper(Cu++), with 2 positive charges), both in its host food and also in your digestive tract to minerals that you consumed in other foods. It does not tend to bind to univalent mineral ions, such as potassium (K+) and sodium (Na+). Brune M et al. No intestinal adaptation to a high-phytate diet. 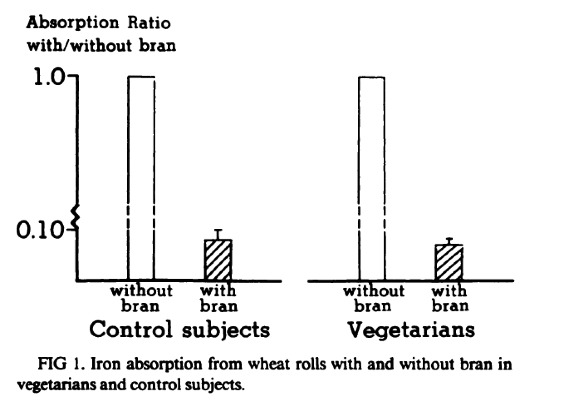 American Journal of Clinical Nutrition 1989; 49: 542-545. ✔ Favorable gut flora - which produce phytase enzymes, and can actually adapt to a higher phytate (e.g. vegan/vegetarian) diet by increasing their phytase production. ✔ Other dietary contributions - such as concurrent consumption of vitamin A and vitamin D (provided in animal fats). Do we need to bother preparing foods to remove phytate? 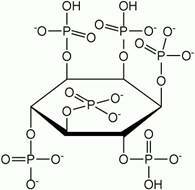 Higher amounts of PHOSPHORUS (and therefore phytate) found in plants grown using today's typical commercial high-phosphate fertilzers - rather than natural compost. Srivastava BN and others. Influence of Fertilizers and Manures on the Content of Phytin and Other Forms of Phosphorus in Wheat and Their Relation to Soil Phosphorus. Journal of the Indian Society of Soil Science. 1955 III:33-40. Many cultures consume grains and beans as staples of their diet - and that includes Westerners, who mistakenly have grains at the bottom of their food pyramid. Vegans or vegetarians center their diet around high-phytate foods as sources of protein amino acids.